It’s easy to forget the true purpose of a cruise is to visit foreign parts – there are too many things to keep us entertained on board these modern ships (or do we call it a boat?). And it hardly looked inviting as we dropped anchor at the first port of call. The heavens darkened as torrents flooded the narrow streets of Cozumel. Apparently it was the first time they’d seen rain since April. We admitted it was our fault; being English we attract grey clouds, just like Winnie the Pooh. Anyway by the time David and Stacey hired a jeep and we’d all piled inside the clouds had emptied and the far horizon looked temptingly bright. Driving out of town on the island’s single ring-road we used our basic map to hunt for the kind of beach anticipated by the prefix ‘Caribbean’ i.e. palm trees with white sands fringed by a turquoise sea. It took a couple of sorties before we found one that didn’t charge per-item (parking, toilets, shower facilities, loungers, being there) as private beach clubs monopolise much of the best coastline, but finally, after bumping down an unmettled track through what can only be described as swampland (with resident tropical mosquitoes), we found what we were looking for. Picture-poster paradise! We settled onto the ‘free’ sun-loungers and while everyone else went to change into swim-suits (only the timid call them costumes) the waiter brought a menu for the beach bar. No coffee? No tea? Now I love an ambitious cocktail but not before elevenses. The man seemed flummoxed by my abstinence – one rum mojito? It’s very tasty! 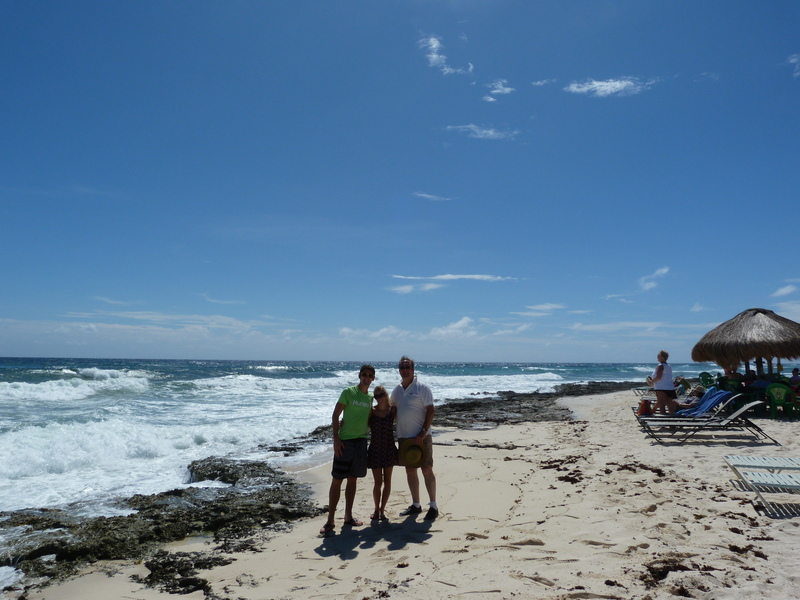 Perhaps…given more time…I might have relented but I wanted to remember my day in Cozumel for all the right reasons. We lazed on the beach and swam in crystal-clear water until the sun beat down so mercilessly we decided it was time to go exploring. We wanted to see the whole island – the ancient ruins, the exotic birdlife and even perhaps one of the native crocodiles (one would be enough). As we rounded the south-east tip the scenery changed dramatically as the road ran briefly beside the shore. 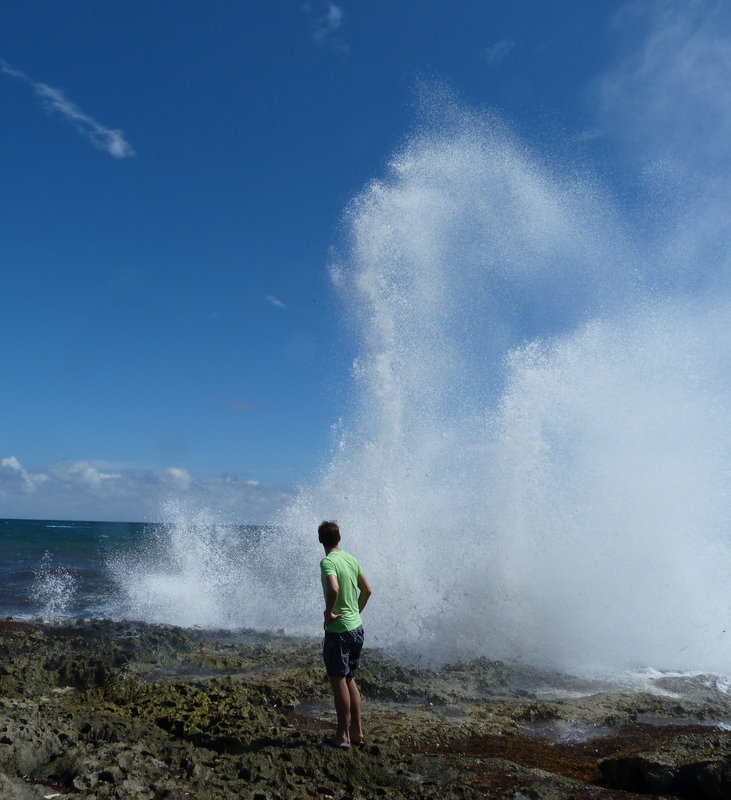 But this wasn’t a gentle laze-in-the-sun beach, although an azure sea stretched out to a distant horizon, Atlantic-driven waves spurt over and through a plateau of craggy limestone, spouting metres into the air, illustrating one of the island’s best natural features – its blow-holes. For millions of years the sea has burrowed through these rocks and geologists have recently discovered this tiny island contains the fifth largest cave system in the world. But we didn’t come to Mexico to go caving. Time for lunch. 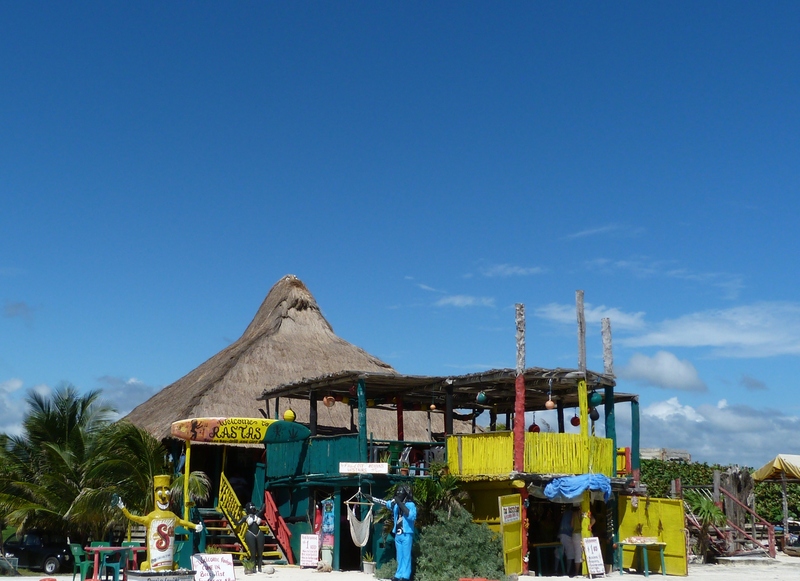 We stopped at a rickety beach-bar (resting on twelve-foot high stilts) because it offered great views, and subsequently broke every ‘safe’ traveller’s rule by ordering fresh guacamole and salsa (the ‘kitchen’ proved to be a tin shed tucked behind the toilet block). 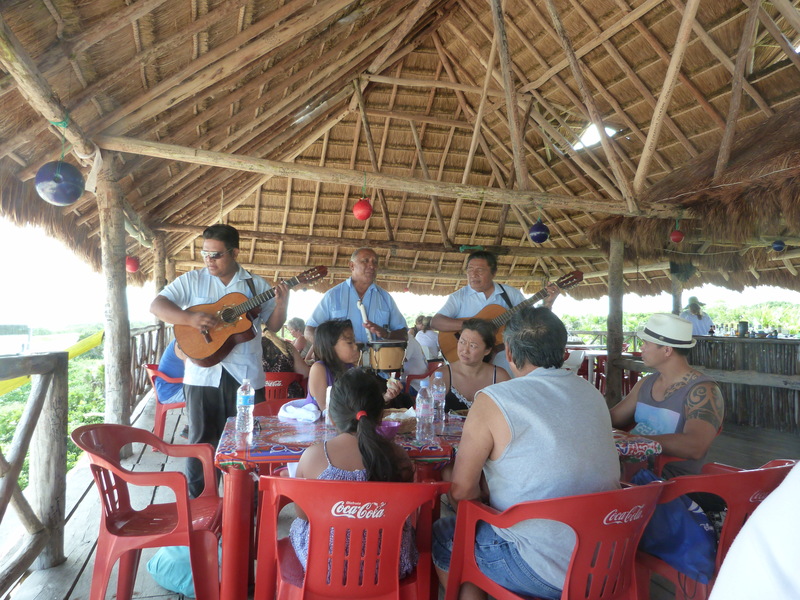 The food was truly delicious but our enjoyment was shattered by a trio of hardy mariachis, two guitars and a percussionist, who’d trailed us from the capital (guitar strung to their backs and drum-kit across the knees) on an aging pair of mopeds. We’d all laughed when we sailed past them a third time not guessing they would track us down! Escaping their enthusiastic rendition of ‘O Sole Mio’ (who requested a love song?) we set off for the temple ruins, our last port of call before re-boarding the ship. It’s believed the island had a population of 10,000 Mayan people before the Spanish arrived. By the late sixteenth century European diseases had decimated the native population and everyone forgot the Mayans. 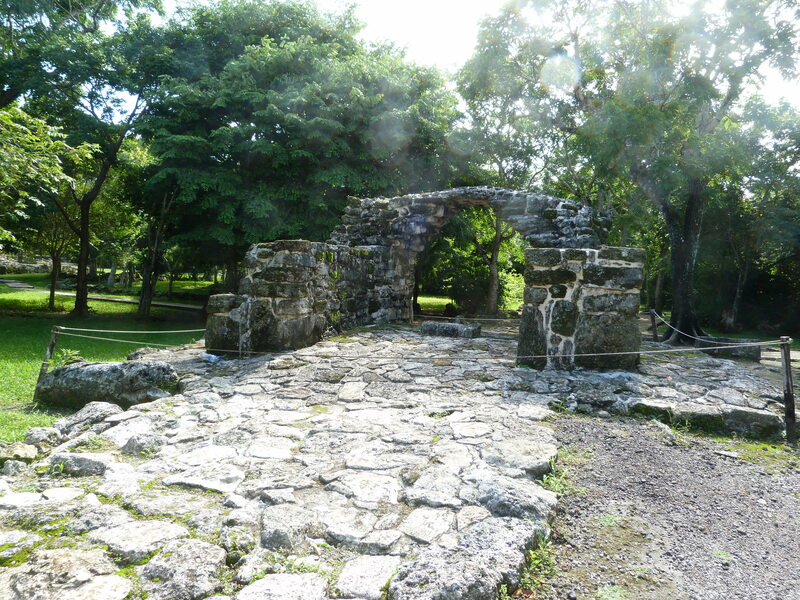 Although the Archaeological Institute of Mexico is responsible for maintaining the ruins they are in danger of remaining an enigma. A very inhospitable armed guard charged us a small fee for entering a concrete quadrangle which housed various souvenir shops and a bar-café full of uniformed guards. We were immediately steered to the opposite side of the square where we were charged a further fee and provided with day-glo-green wristbands which, it was explained, permitted entry to the Mayan complex. What the first fee covered was never divulged, and we were far too intimidated to enquire, but we had our suspicions – gazing at the officers at the bar. I only wish I’d remembered the Deet. Before we reached the first set of temples we were consumed as ‘plat du jour’ by a vigorous insect population. Shorts and T-shirts proved an open invitation to hungry hoards who obviously relished Brit. At first we braved it out, running along some ancient track that kept our feet above swamp. We viewed the ruins in fast-forward mode – look…there’s a carving, look…that’s where they sacrificed people, look…there’s a giant iguana….crikey he’s real. Do they eat Brits? Rather than test the theory we raced back to the car – Indiana Jones eat your heart out. David’s previous experience on Cozumel taught him to allow plenty of time to drive through the island’s capital. Although we had ‘the map’ roads weren’t numbered, or even classified as to size or quality, and negotiating what appeared a simple grid-system proved tricky. Our first choice was one-way – in the wrong way and the next option wasn’t wide enough for a four-wheeled vehicle wanting to retain both wing-mirrors so we felt blessed when we finally reached the harbour unscathed. David returned the jeep, leaving us to quickly browse a street market before making our way back to Navigator. Enough foreign parts for one day!